Saturday, April 27th, 10am to 2pm in the parking lot at Our Redeemer’s: 25th Ave NW at NW 85th St. Please note start time, and kindly do not drop off anything before 10am. 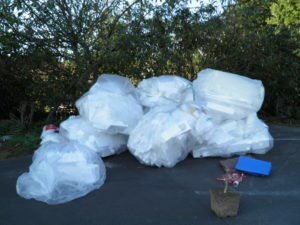 The EarthCare Team at Our Redeemer’s will be on hand to collect clean, dry styrofoam (please remove all tape and labels; Styrorecycle cannot accept hot tub covers, insulating foam or anything that is dirty, wet or has been left outside). PLUS gently used clothing will be collected for donation to The Bridge Care Center (adult clothing) and Mary’s Place (children’s clothing). BONUS! You can donate your used bicycle to be given to BikeWorks. BikeWorks repairs bikes to keep them out of the landfill. Recycling is FREE. Donations will be accepted to defray the cost of transporting the styrofoam to the StyroRecycle location in Kent, and to support the youth programs at Our Redeemer’s.